There is much debate about the origins of this breed especially as they are seen in artwork dating back to the Middle Ages. Some of the earliest is from Northern Europe particularly Germany and they are seen in the Lion cut. still used today A number of explanations have been put forward and the opinions vary that dogs from Tibetan regions arrived in Europe and developed into some of the toy breeds we know today. Although many people see them as small lapdog types this is far from the truth and the Lion trim is an indication of its true character and they may well have started out as a court guard dog for the ladies. They are also a very attentive breed and can be trained to do a number of tasks for example their use as Hearing Dogs for the Deaf. 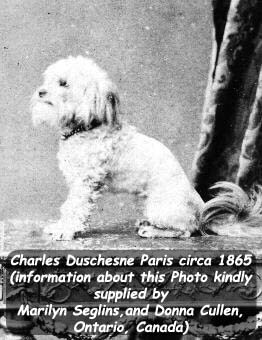 The Lowchen may indeed be the origins of the Bichon family and possibly the early foundations of the toy Poodle, what however is not known is the reason for their decline in the latter 19th and early 20th century's. The picture on the right was purchased from an art shop in 1981, and it now seems to be readily available for sale on the internet.We only have the young lady's name which is English but we have been unable to find out where she lived. It is very likely that the painting was done in Italy as the artist. 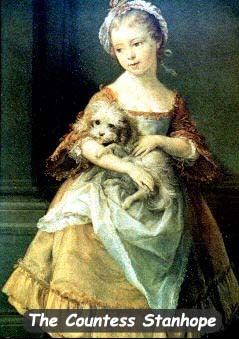 is Batoni Pompeo (1708-1787) He is thought to have been one of the most popular artists to paint the English aristocracy in Italy and it may be that the dog she holds belonged to the studio. The photograph on the left was bought at a show much later and we were kindly sent the details by e-mail. At the end of the 2nd World War when exhibiting had yet to start again it was the determination of Madame Bennert to revive the breed she had previously owned that the Lowchen was saved. All of today's Lowchen come from the four she obtained to start the breed on the road to revival and from this came the expansion of the breed again in Europe and eventually all over the World.